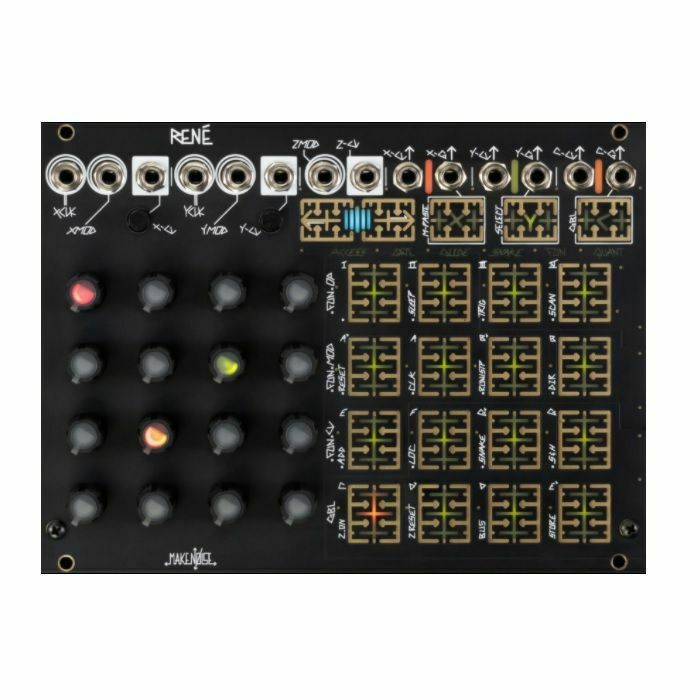 MAKE NOISE Make Noise Rene Cartesian 3D Music Sequencer Module (2018) vinyl at Juno Records. The Rene music synthesizer module is a powerful three-dimensional prism of composition. It is the world's only 3D Cartesian Music Sequencer. Named for the French philosopher & mathematician Rene Descartes, it uses the Cartesian coordinate system to unlock the analogue step sequencer from the shackles of linearity. The original Rene was a one-channel, two-dimensional Cartesian sequencer with limited memory, this new Rene is a three-channel, three-dimensional Cartesian sequencer with memory for up to 64 complete States. Considering the multiple channels and FUN programming options per multiple axis, Rene has become an n-dimensional matrix or tesseract of synthesizer sequencing.